Crispy trimmed scallions, individually coated with softened cream encircling the bulbs. Then encased with freshly sliced deli meat. Enticing appetizer for any event! The next time you are entertaining your guests or whether you are asked to contribute to that next party– these perfect little Scallion Wraps are the way to go! Justin’s mother has always made these for her sons on very special occasions and holidays. The tradition has carried over to the next generation. Now we always make these for Thanksgiving and New Year. The whole family really looks forward to this. I think more so than the main dish! I’m simply telling you that these are a huge hit! You’d better make a few more of these wraps than you’d expect. Because, these meat wrapped deliciousness disappear fast! Try to make them while no one else is in the house…Because if your house is like mine, everyone will be eating the finished product before you are even able to put them onto the platter! 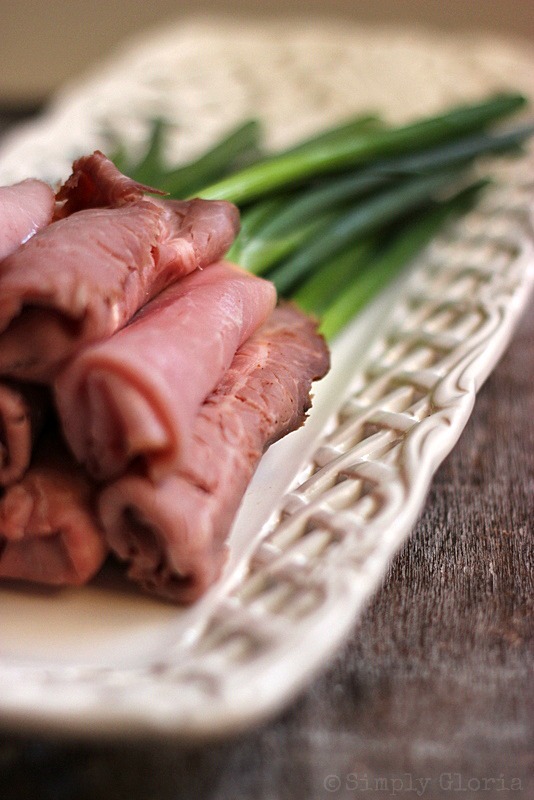 There are endless varieties of deli meats to wrap around the scallions…going along with the heavenly cream cheese in the middle! This is such a short and sweet savory kind of recipe! These Scallion Wraps are so easy to put together ahead of time or overnight. I wanted to share with you just how simple these are…AND tantalizing! 5 slices of your favorite fresh deli meat (thinly sliced), cut in half to make 10 pieces. After rinsing the scallions with cold water, trim the tops about an inch down. Trim the roots off of the bulbs, as well. (The white part.) Pat dry and peel off any bad part that is lingering around the bulb. Scoop about a teaspoon (or two) of cream cheese onto the ends covering the bulbs and spreading it up a little. Lay the cream cheese covered bulb end on top of the sliced deli meat. Fold the bottom part of the meat onto the bottom of the bulb, covering the cut tip of the scallion. Tuck and roll the rest of the meat around the cream cheese covered area. I had a friend that would bring these delicious savory wraps to every gathering! I haven’t seen these in a while. It’s good to be reminded of the easier appetizers during this busy time of year! Thanks! What a unique and savory appetizer! I’m not surprised that they disappear quick. And they look so easy to make. I need to add these to the menu for my next gathering or party. You’re right Ashley, these are super easy to make….you’d love them! Hope you’re enjoying your day…almost the weekend! This is such a great idea for an appetizer! It is similar to an itialian appetizer where they wrap the meat around cantaloupe and leave out the cream cheese. I prefer this over that any day! Hmmm, I’m going to have to try that one with the cantaloupe, Nancy! Tina, I love the idea of using asparagus. Going to have to try that! Gloria, I love this idea for a delicious and easy appetizer! This is the season when we need easy, right? They look like I could pick one up and eat it (please!) 🙂 Thanks for sharing and pinning! Hope you have a happy Friday! My mom always used to get ham and spread the ham with the cream cheese, put a scallion or pickle in it and wrap it up. She’d them cut them into pieces about 1 inch long. Perfect for popping in your mouth. OMG, my husband loves those and every holiday we make them. Counting down to Thanksgiving! What a great idea, Rhonda! Those sound soooo delish! I’m going to have to try that next time…thanks! What a great idea for an appetizer, love it! Thank you so much, Swikruti and Rakesh! You’d love these! haha.. Mike’s favorite place to hang out is the deli counter too. In fact, last time I was there him and Cason sat there and sampled for at least 10 minutes and of course I walked away with meat and cheese. 🙂 Boys! Totally loving these scallion wraps and love how simple they are. Definitely going to have to try this year for an appetizer. Pinning! You’ll have to give it a try…I’d have to say it’s mainly a manly treat…maybe bcz I am always surrounded by my men/boys! Have a safe trip, my friend! Stopping by Best of the Weekend link party. 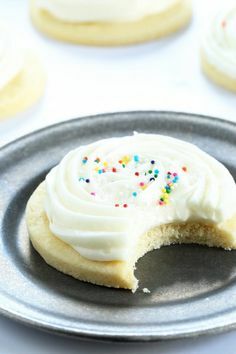 These look amazing and so simple and a great option besides just sweets. I personally wouldn’t like these because I hate onions but they would make a great party appetizer for other people! Thanks for sharing on the weekend re-Treat link party! These wraps are so beautiful and original! I love yummy traditions like these 🙂 Pinned and can’t wait to share with MY family! Have a wonderful Thanksgiving Gloria! This is very interesting! We’ll have to try it! Thank you to you both! Hope you enjoy these as much as my family does! Sounds like a perfectly delicious appetizer!! I might just have to make these!! You’ll have to give these a try, Jocelyn. Our family goes crazy over them every year. Have a happy Turkey day!